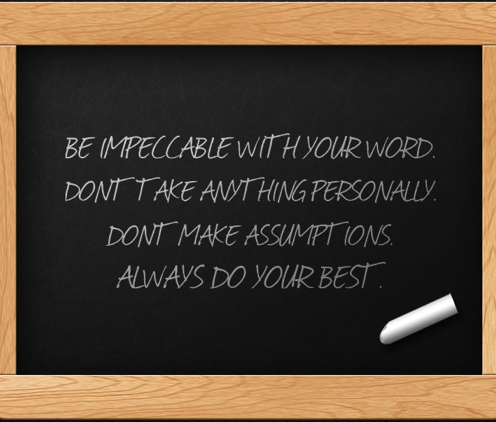 The Four Agreements might be my favorite book. I think it should be essential reading for every human being. It's quick and easy, and will leave you challenged and inspired. 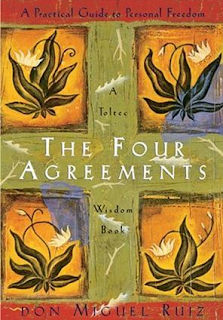 A New York Times Bestseller for over 7 years, it was written by Mexican author, Shaman and teacher Don Miguel Ruiz. Based on ancient Toltec wisdom, the book proposes 4 tenets for living that no doubt will broaden your perspectives on yourself and the way you interact with the world. Each chapter breaks down an agreement in perfectly practical fashion. These simple yet powerful concepts will seriously impact your way of being. I highly recommend!!! A while back I typed the agreements out and posted them in my bathroom and at the office. They're great reminders to keep yourself in check on a daily basis. Yesterday I found a store that sold bookmarks with the agreements on the front and their descriptions on the back. I cleaned them out...think I got 6! I might have to purchase this even though I already have a copy. It's an amazing price with the 2 additional books- haven't read them yet. There is nothing like great/inspiring iPhone apps. Thanks for posting. I am going to post this on my nao fb page.